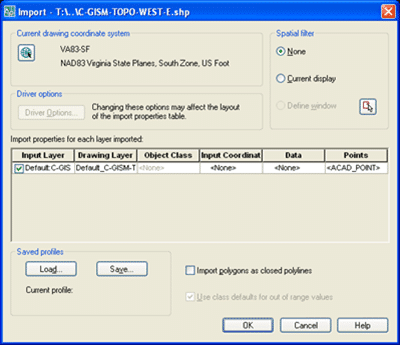 Perhaps one of the most common GIS related tasks I am asked to help with is how to import and then elevate GIS contour data. Oftentimes this data is provided as an ESRI Shapefile, and when imported has no elevation. While GIS contour data isn’t accurate enough for precise design, it is often sufficient for the purposes of preliminary analysis or broad design considerations. While the details of course vary depending on the data source, all GIS contour data generally share some fundamental similarities. Of these is the concept elevation data is encapsulated within a one of the data fields of your shapefile. Elevating GIS contour data can be summarized in two parts; importing the data, and elevating the data. Unfortunately these two parts cannot be done concurrently, and instead must be done separately. 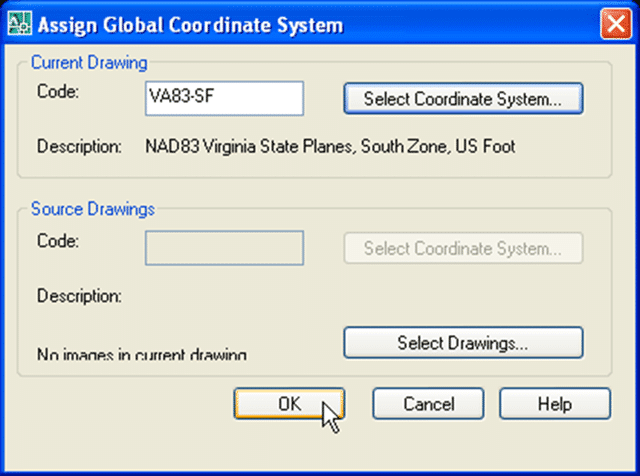 In this, the first of a two-part posting, we will look at how to import GIS data as AutoCAD line work into a drawing. Some things to note about this process. First, you are actually importing the data into your drawing, not linking to it. What that means is if your GIS data source ever changes, the data we import will not update. While my focus will be on importing contour data, this process will work for any ESRI Shape file. Something like contour data doesn’t traditionally change all that often, whereas parcel data is generally changed daily. Thus like anything, there are advantages and disadvantages to this process that you will need to evaluate. We will start by importing your GIS contours into a new drawing. Since contour drawings tend to be somewhat large (in file size), I traditionally separate my existing contours and existing site features into two drawings. This helps be keep my individual file sizes as small as possible, and so for purposes of this tutorial, I will follow that practice. Using the “Map Classic” workspace. 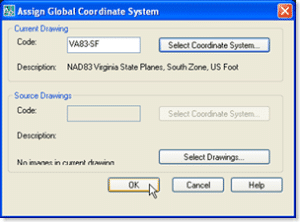 “Map > Tools > Assign Global Coordinate System”. In my case I will be using NAD 83 Virginia State Plane South Foot (VA83-SF). 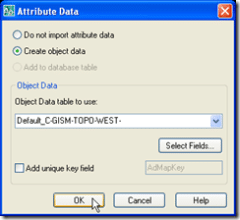 Go to “Map > Tools > Import”, and specify a GIS file to import. 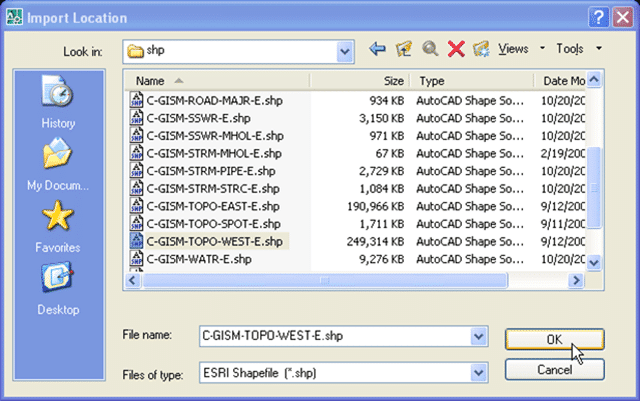 You will likely have to change he “Files of type” to “ESRI Shapefile (*.shp)”. The resulting “Import” dialog has a number of options, many of which are easily overlooked. Spatial filter: This is an area many seem to overlook. By default AutoCAD Map 3D is going to import the entire Shapefile into your drawing. Oftentimes GIS data is provided for an entire locality, and thus you probably don’t want or need the entire locality imported into your drawing. 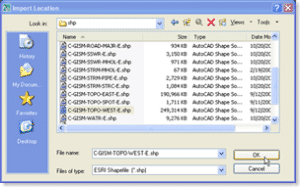 None – AutoCAD Map 3D will import everything contained in the specified Shapefiles. 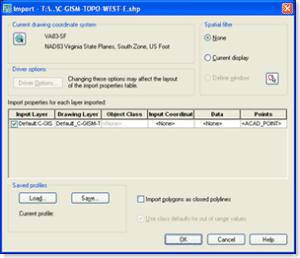 Current display – Imports any data that falls within your current drawing window. Do note that unless you are zoomed into an area with data, no data will be imported. 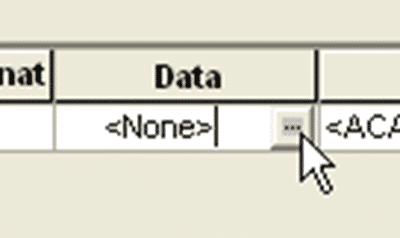 button will allow you to draw a window around the area containing the data you need. 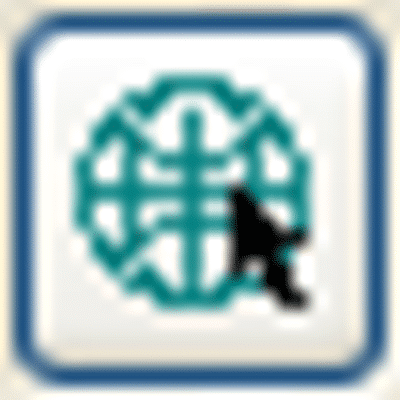 After a window has been defined, the radio button will be enabled. 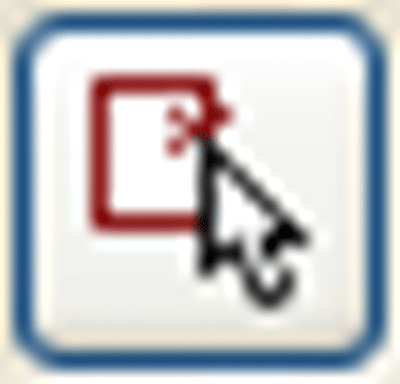 Select the […] button by clicking into the data cell of your layer. 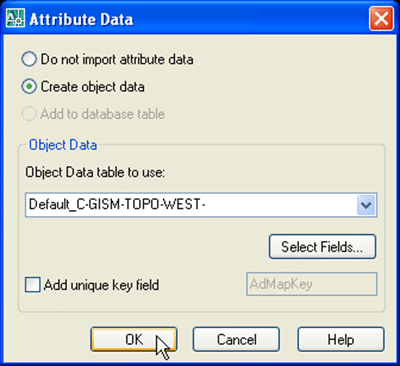 From the resulting “Attribute Data” dialog, select the “Create object data” radio button, and press [Ok]. When working with contours (polylines), it’s not as important to select the “Import polygons as closed polylines” option. When importing things like parcel lines, I always select it so my parcels come in as normal AutoCAD polylines. At this point you have finished defining the way your contours are to be imported into your drawing, and can press the [Ok] button to continue. The time AutoCAD requires to import things will of course vary depending on the size of your source file(s). 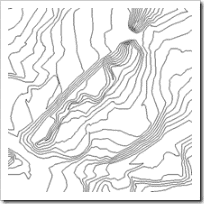 Once AutoCAD Map 3D finishes processing your data, you will have GIS contours as AutoCAD polylines in your drawing. As stated at the beginning of this post, each of these lines will have an elevation of 0. While the elevation of the line itself is 0, viewing the properties of any line will list the elevation. That value was imported from the SHP file data. Even still, being able to reference the elevation is only but so helpful. In part 2 I will discuss how we can have AutoCAD Map 3D elevate a line based on it’s associated GIS data. Good stuff. This info should come in handy with the surveyors we work with. @CAD Services – Glad this post helped you out! As you may have guessed, it’s one of the more popular posts here on The CAD Geek. I came across this post while searching for help on the internet (don’t know AutoCAD or GIS all that well). It worked great and the instructions were explained very clearly. Thanks a bunch! Coffee is on its way. Thank you for putting this post up. It’s saved me several hours or work on a Friday afternoon and I appreciate the detail that you put into it. Thnx for sharing the info. I am an architect actually, working with http://www.designpresentation.com, but was also trying my hand at this technique, which u just told. Donnie, I found your method very straightforward and helpful, especially for someone who hasn’t used AutoCAD much since R12. Thanks! By the way, I take issue with your statement “While GIS contour data isn’t accurate enough for precise design…” GIS data is as accurate as its source, it has nothing to do with it being stored in GIS. If that source is a topographic survey done at 1″ = 25′ then it will be just as accurate as the original, or if the source is a USGS 1:24000 DLG it will be as accurate as NMAS/FGDC standards dictate.